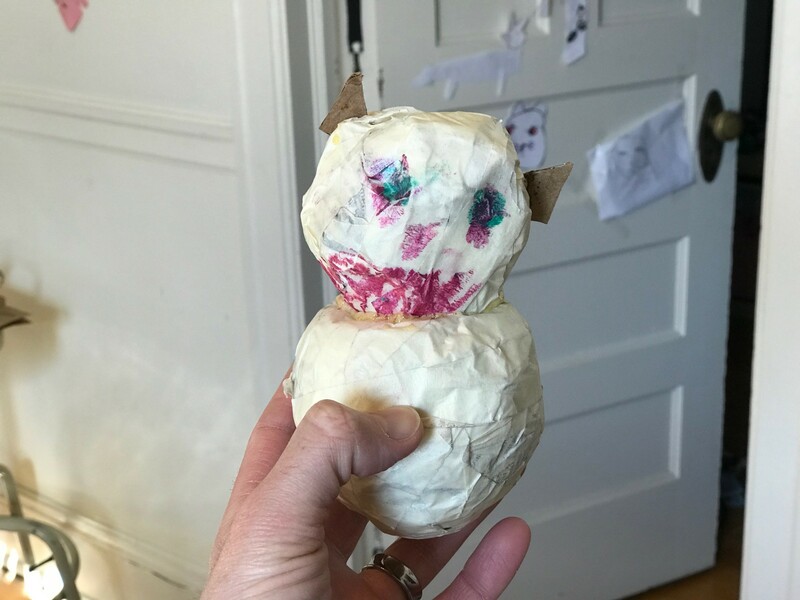 She wanted a Hatchimal (like, a deluxe one), but I’m not spending $60 or whatever, so I made her this out of newspaper, masking tape, and wood glue (decorative elements credit: Rory Ellison — which looks more like the Joker than a Hatchimal, but is cute nonetheless). I remember reading an interview (which I can’t find for the life of me) a long time ago with Guy Kawasaki, one of Apple’s original evangelists (in the marketing sense). The interviewer asked him to tell the audience a little about himself. I was expecting some bloated answer about Silicon Valley entrepreneur extraordinaire, blah, blah, blah, but his answer was short and shocking. “I’m a dad,” Kawasaki said. I was reflecting on this the other day. I’m in a season where I’m trying like crazy to answer my vocational calling in midlife (or, maybe, slightly pre-midlife). I feel like I’ve wasted some time (give or take a decade or so) and have all these lofty plans and schemes and goals to catch up and ‘make my mark’ (whatever that means) in the short amount of time I have left. I wrote the other day about how many past lives we have. As I reflect on the concept now, I realize there were really only two lives: Pre-kiddo and post. No matter what kinds of awesome things I may think I’m up to for my own sake, truth be told that all of it boils down to one thing.